Radiesse is a next generation dermal filler that restores a natural, youthful look and does more than just fill in lines and wrinkles- it volumizes! It provides immediate, visible improvement of folds and wrinkles with long-lasting, beautiful results. Is an FDA-APPROVED wrinkle treatment used to correct moderate to severe facial wrinkles and folds around the nose and mouth, such as nasolabial folds. May require LESS FREQUENT office visits for retreatments, saving you time and money. 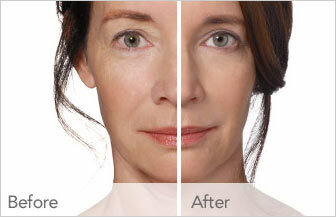 The wrinkle treatment results provided by Radiesse dermal filler are immediate and long lasting. The effects of Radiesse may last a year or more in many patients. In addition, Radiesse treatments may require fewer office visits for retreatments. Since results may vary, be sure to discuss your expectations with your Radiesse physician. • Visit the official Radiesse Website. • View the official BEFORE and AFTER Radiesse Photo Gallery. • Click here to read important Radiesse Saftey Information.